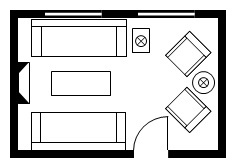 I've just realized that I've named this page walk in closet design but most of the stuff that's on these closet design pages applies to all closets: walk-ins, reach-ins, wardrobes as well as dressing rooms. 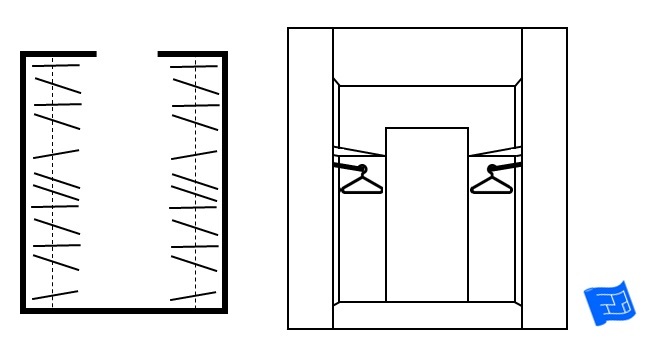 These walk-in closet design pages form part of the room design series. The kitchen and the bathrooms of our homes are frequently used functional spaces. The closet is probably third on the list so it's worth spending time thinking about your walk in closet design. And I've got great news for you. No matter what you're budget, the success of your walk in closet design depends much more on the position of the rods, shelves and drawers than it does on the material from which it is built. 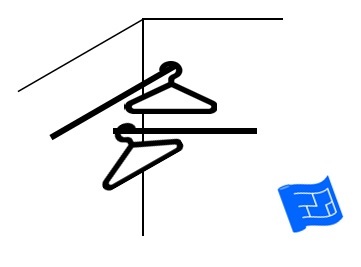 First of all, so that you can understand the closet floor plan diagrams in this section, on the left here you can see how I've depicted a closet rod with hangers in the diagrams. Here's a few design principles to check for in your walk-in closet design. A closet should be well lit so that you can see what you’re going to be wearing. You'll need lighting for when it's dark outside and for during the day natural daylight is best. A skylight works equally well as a window. Of course for a walk in or reach in, you only need the artificial light. Store outer clothing and accessories so that they are as visible and as accessible as possible. If you see it you're more likely to wear it and it will be easier to put together outfits. A closet should have a seat nearby to make pulling on those socks, tights, trousers or whatever that bit easier. A good closet uses all available space. A good closet has well organized space designed with a combination of hanging, shelf and drawer storage. Ideally closet space is adjustable and can be changed as storage needs change. A full length mirror is indispensable. Here's a standard closet with lots of wasted space. If you don't plan your closet, this is the arrangement that the builder is likely to give you. 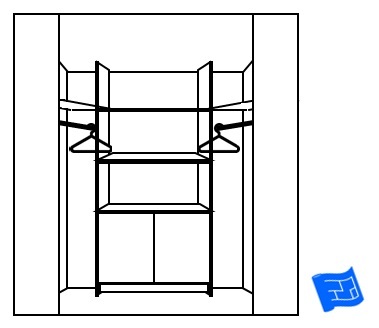 A one height, non-adjustable closet rod and if you're lucky you might get a shelf. There's lots of wasted space at the bottom of the closet. Here's a closet where most of the hanging space is hidden behind the wall to the closet. 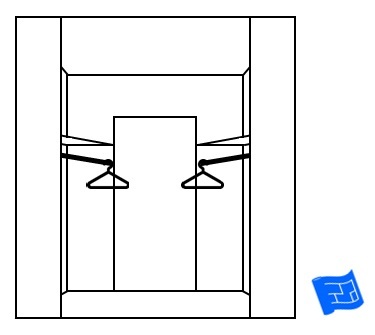 This closet would be fine if it was fitted with doors that opened the full span of the rod. 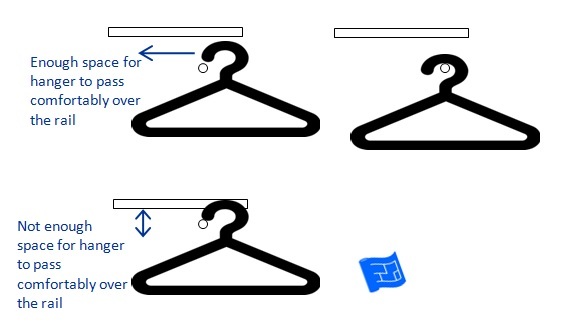 If the rod is installed too close to the shelf, it's impossible to hang anything up. Here's a rod that's too close to the doorway. You can see how the hanging rod itself doesn't interfere with the doorway but once there are clothes hanging on the rail they encroach into the doorway. 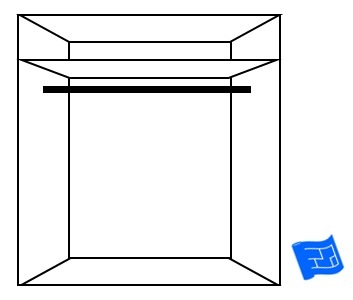 If the door opens inwards into the closet this prevents the door being opened and closed. Now imagine that door is a set of shelves. See how the hangars are interfering with the shelf space. 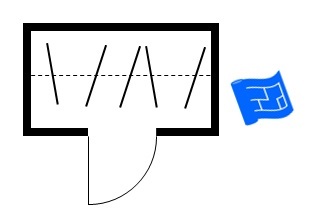 Here's a design where the rods come into the corner. This is another instance where the location of the hanging bars looks fine until the hangars are introduced. In the corner the hangers are occupying the same space. How deep are your closet shelves and drawers in your walk in closet design? Shelves and drawers that are too deep are annoying in a closet because the items that are at the back of the shelf or the drawer are not accessible enough unless addressed by smart storage solutions. The design a closet page shows you how to avoid these problems. Some examples of the ideas discussed on this page and the other walk-in closet design pages are illustrated below. It can help bring the ideas to life to have some colorful pics to look at. 2019 houseplanshelper.com. All rights reserved.